Figures and statistics from Iran's economy are indicative of an imminent collapse. Officials warn of water shortages, gas and electric shortages. The living standards of a people who live in a country which is the fourth largest oil producing country in the world has been steadily falling since the 1979 Islamic revolution and in the last 8 years, the decline in the standard of living of Iranian people has been tantamount to a free fall. While Rouhani and his administration keep warning of the necessity to tighten the belts further, the Supreme Leader and his commissars are singing an entirely different tune, they want Iran's population to double. Iran's handpicked lawmakers who have had to go through the rigorous pre-selection by the unelected Guardian Council are intent on banning vasectomies, condoms and other birth control measures. Any sane person would shake his head in disbelief at this paradox, How can doubling the population at a time when Iranians are told to either tighten their belts or face an economic abyss, make sense? Where is the money to support and sustain thispopulation explosion going to come from? Clerics appearing on state TV curse the previous birth control programs. 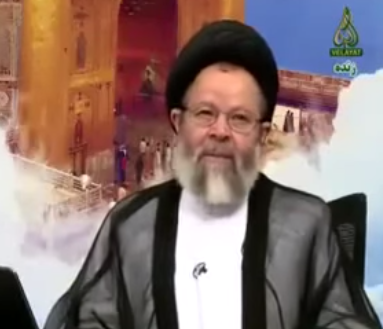 They tell the faithful viewers “for the love of the holy Zahra and for the love of Imam Ali, the prince of the faithful, save yourselves from this ominous culture of one child or two children nonsense ” one cleric tells the viewers. Imagine if every Iranian couple listened and had fourteen children in the names of the “Fourteen sinless”! - by the way only one of the fourteen sinless is a female! So what is the cause of this madness? Is it simply yet another sign of sheer ignorance by the mullahs? Is it as some have suggested to make sure there are enough Shiite soldiers to fight a holy war? Are they expecting a holy war soon and fear being outnumbered? A cartoon by the exiled Iranian cartoonist, Mana Neystani, showing a Shiite combatant holding his wife like a rocket propelled grenade launcher firing children at the enemy through her legs went viral in the Iranian cyber space. Or is this all simply a way to continue survival for the mullahs, as it is often the reason behind their mad policies? One thing ideological dictatorships hate most is a thriving middle class. An affluent middle class is moderate and shuns extremism, it is liberal minded and wants to be part of the mainstream world. The thing that worries the mullahs most is the striking contrast between themselves and the population. Anyone who travels to Iran can notice this contrast. This is a regime which does not represent the population. The two seem to be on different parallel universes. By keeping Iran's middle class a small minority, the mullahs will be able to rely on a poor majority which are easier to manipulate and easier to string along with meagre hand outs. The declining Iranian middle class and its tragic consequences which will limit Iran's economic revival is an issue that the renowned Iranian economist, Mohsen Ranani often writes about. He refers to the systematic destruction of Iran's middle class as “historic treason”. Ranani fears an increasing polarised class divide in Iran, a very rich small minority and a majority below the poverty line population. Cynically you could say they now need to replace those they're been increasingly hanging since Rouhani took office. But as per usual, it's just dumb monkey mathematics desperately trying to save the Regime's crumbling equation! please dont say all these lies!!! no one in iran want to have 14 children! I am a young girl who has no sister I want to have atleast 5 children after marriage because I want to have a true family I want let my children to have brothers and sisters to support sadness and dont be lonely with parents in home! you are pessimistic and just write your pessimistic ideas, and make all the world pessimistic about iran.